Chagrin and bear it: In the messy final, wiseguy Wiseman pleaded with the table for relief. 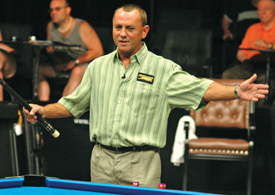 With $15,000 payouts for first place and particularly thorny fields, the Championships have traditionally been considered among pool's domestic majors. If the GenerationPool.com moniker doesn't ring a bell, that's because the host, the Billiard Congress of America, has changed the name twice over the last two years - from the BCA Open 9-Ball Championships in 2006 and EnjoyPool.com 9-Ball Championships in 2007. This year's event also came with new dates and location. BCA brass transplanted the event from its traditional spot alongside the BCA Pool League's national amateur event in May in Las Vegas to the Charlotte locale during the trade association's annual Expo. Due to time constraints, the usual men's field of 64 players was pared to 32. The Women's Professional Billiard Association maintained a 64-player field for the women in keeping with requirements for Classic Tour points events, kicking off the early rounds on June 6 at a local poolroom. Despite a halved field for the men, it was obvious from the early going that the road to the final would be treacherous. The first wave of eliminated players included 2001 BCA Open champ Corey Deuel, 2002 titlist Charlie Williams, and 2007 runner-up Shane Van Boening. Wiseman caught a break with a first-round forfeit from Lee Chenman, and then carved a path to the semifinals through Mike Davis, 11-7; Charlie Bryant, 11-4; and Stevie Moore, 11-6. Remarkably, the 52-year-old action hound has improved his tournament showings in recent years and is considered a legitimate threat in major events. "It's just a game," said Wiseman, known for his easygoing outlook. But his contentious semifinal match with Johnny Archer was anything but carefree. Wiseman mounted the hill first in the semifinal, 6-4, after Archer suffered through a series of scratches and misses, whipping his cue around in disgust after poor shots. Running out for the match, Wiseman sank the 4, but his cue ball glanced off the 6 and rolled within a few millimeters of the 5. He drew a bead on the side pocket, raised his cue and moved into position for the shot. Just then, Archer interjected with a question for tournament director Steve Tipton, who was in place to observe the hit, about the rules for such tight shots. Forced to retake his stance, a rattled Wiseman missed. Archer was able to tie the match, 6-6, and attempted to shake Wiseman's hand and apologize before the final break. Wiseman refused. After Wiseman won case game, the pair got into a short spat just behind the cameras about Archer's ill-timed question. Wiseman took it as sharking. "I'm shooting a shot, and all of a sudden he gets up to say, 'What's the rule on this?' Was this his first tournament or something?" Wiseman said afterward. "The referee is watching, and if it's a foul, it's a foul. So what do you call that? It's a move. It's an ugly move." Archer conceded that that his timing was bad, but denied trying to shark Wiseman. The rules for such shots shift from event to event, he said, and it appeared to him that Wiseman was about to commit a foul. "I just wanted to know what the rule was," he said. Jones earned his berth in the final with Wiseman under less controversial circumstances. He played convincingly through the early rounds, defeating Matt Krah, 11-5; Mika Immonen, 11-9; Gabe Owen, 11-6; and Raj Hundal, 11-9. Against Shawn Putnam in the semis, he survived a slow start to build a 5-2 lead. Putnam took advantage of a Jones scratch to get back in the match, but jawed a 9 ball that would have cut the deficit to 6-5. Jones calmly sank the 9 for the win, and shrugged apologetically to his opponent. "I want to crawl under the table," the chagrinned Putnam said after the match. "I won't make any excuses. I missed some balls and couldn't get some rolls off of jump shots and safeties."